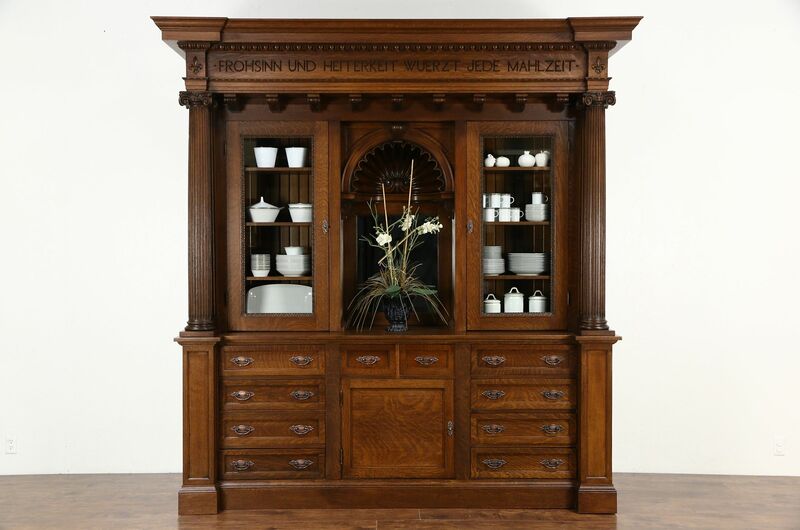 A solid oak sideboard and china cabinet or back bar was hand carved for the sausage king, Frederick Usinger of Milwaukee. The three story mansion was erected in 1899 on Highland Boulevard and was described in several historic books and has been demolished. Solid quarter sawn oak, the restored finish is in excellent condition on this one-of-a-kind custom cabinet. The German inscription translates, "Cheerfulness and Serenity Season Every Meal." A hand sculpted shell above the center niche is masterful. The back is wainscoting and the mirror is beveled. Fluted columns are shaped, coppery patinated hardware is original. Shelves adjust on wooden supports. There have been various restorations. This large antique furniture disassembles for easier delivery. Measurements are 100 1/2" wide at the crown, 31" deep, 104" tall and the base cabinet is 38" high.